ast week I was talking with a dear friend of mine, Tamy, about quilting and trying my hand at making a baby quilt this spring. I wish she lived closer so she could help me. I'm a novice when it comes to sewing. I'd love to learn, but I'm always so worried that I'll ruin the fabrics so I always hesitate to just jump in. I made the button-up shade in the nursery with my mom's help. LOTS of my mom's help. Actually my mom made the button-up shade in the nursery with a little of my hindrance, that's probably more accurate. I did make a basket liner, but it's seriously a bit wonky inside. Thankfully it's not noticable when filled with toys, but I've hesitated to finish the rest. I have to get to it sooner or later. 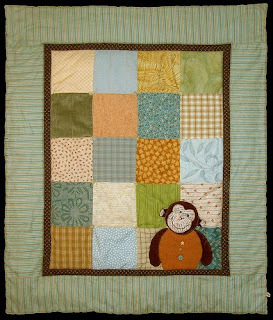 So I'm planning to spend a few weekends finishing the basket liners, but I'd also like to make a quilt for the nursery. Tamy was sweet enough to write up a pretty detailed post about quilting and getting started with the process for me to reference. I asked her for some tips and she wrote me a novel about how she got started, the tools she recommends for beginners, picking colors, easy patterns to get started, and how to keep it all organized. She is also hosting a giveaway of a few quilting patterns and a book, so if you are interested head over and leave a comment to enter. I love the idea of a quilt like this. A fairly simple pattern with a twist in the corner, I just have to keep the "twist" simple enough for me. Cute cute shade! I'd probably need someone to make it for me too. ;) I am a sort of sewer. I like to plan, pick out materials and bring them all home. Then they sit on a shelf forlornly waiting for me to get the courage up to start the project! Kiy: That would be fun!!! Yeah I have bigger plans than I have time often enough. I wish I was closer so I could help you. You've done really well on the shade and basket liners and I know when you dig in your heels the rest will fall into place. I'm always available for questions. Maybe you and Kiy and I could meet in the middles sometime for a quilting weekend? That would be fun. I'm not a sew-er (I originally typed it as "sewer" which could, of course, mean something else entirely, LOL!). I'm more of a gluer. If I could only glue a quilt together....!